In mid-1941, Władysław Anders — a 49-year-old Polish cavalry general who’d been captured by Soviet troops while battling the invading Germans at a time when Nazi Germany and the USSR were allies — was lingering in a Moscow dungeon belonging to the NKVD intelligence service, waiting to be shot. But then in June that year, Germany attacked the USSR. The German operation, code name “Barbarossa,” saved Anders. Aligning with the British and other Allies, the Soviets accepted that they would need to mobilize all available combatants, even former enemies, in order to defeat the Nazis. Anders became the head of a Polish army whose tragic and epic formation and journey across the USSR, Central Asia, the Middle East and Italy is the subject of Norman Davies’ incredible new book Trail of Hope, out now from Osprey Publishing. It was 8:00 P.M. when the car left the NKVD building. It was already dark, and the street lights were dim. There were very few passers-by, but quite a number of vehicles, all army ones, and all making much use of their klaxon horns. For nearly two years I had lived in prison cells. Now the fresh air, the noise of the streets and the traffic almost intoxicated me. How strange it was to be free again. The USSR had imprisoned 1.5 million Poles, including some 200,000 soldiers. Moscow authorized Anders to raise an army of 30,000 from this manpower pool. Easier said than done. 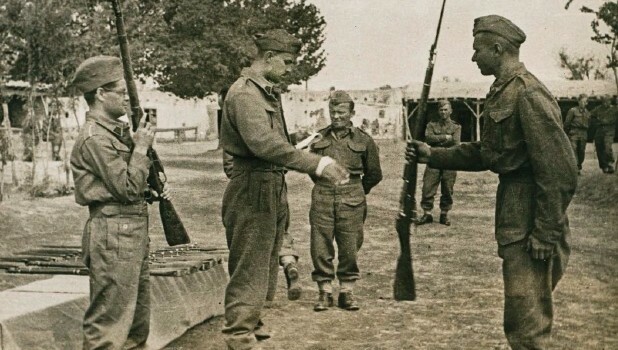 “He had no staff, no soldiers, no arms or equipment, no bases and no independent sources of supply,” Davies explains in his lavishly-illustrated, deeply moving book. Soviet authorities released hundreds of thousands of Polish prisoners. And when word got out that a Pole was raising a Polish army, countless ex-soldiers and civilians did everything in their power to reach Anders’ camps and the expatriate communities the army fostered and spun off. In the spring and summer of 1942, that the Polish Army in the USSR began to take shape. New recruiting posts were opened to deal with the constant stream of newcomers. New disputes arose with the NKVD over who could or could not be admitted. And new provisions were made for the formation of a Women’s Auxiliary Service and for the care of dependents. Above all, the men could eat regularly, rest, recover their strength and train. Uniforms, weapons and other supplies were delivered by the British Army via Iran. News of the Polish Army’s formation gradually filtered through to all parts of the USSR, inspiring many of the stranded exiles to undertake a hazardous journey to try and reach it. Many traveled as would-be recruits. But most were moved by the expectation of finding shelter and security by simply being in the vicinity of their compatriots. They came by boat, by train … and on foot, following the army even as it decamped and moved into Central Asia. Setting off from northern Siberia with a group of companions, he claimed to have crossed the Gobi Desert, the Tibetan plateau, and the high Himalayas, and after two years on the road to have walked into British India. When his book, The Long Walk, was published in London in 1956, many reviewers judged it incredible. It certainly contained numerous inconsistencies and embellishments, that raised the possibility that Rawicz did not make the journey himself. Nonetheless, as the archives from 1943 confirm, incredulous British officials in places as far apart as Delhi and Kabul reported the arrival of footsore Polish refugees, who said that they had escaped from the USSR. In 2010 the story formed the basis of a popular film called The Way Back. Ultimately, Anders deployed his army of some 40,000 men — and tens of thousands of civilian hangers-on — into Italy under the umbrella of the British Army. The Poles fought fiercely, helping to reduce the German fortifications in the medieval abbey at Monte Cassino. After the war, the Soviets occupied Poland. Anders never returned home, dying in London in 1970. His army’s grand tale had a bittersweet ending. So the trail had many ends, not one; it led to all the continents of the world (except perhaps Antarctica). But Poland itself must not be forgotten. The great majority of men and women who left the Soviet Union in the ranks of Anders’ army, or under its care, had dreamed of reaching ‘Poland.’ The Poland of their dreams, however, was dissolving, even as they journeyed to find it. It is said that the number of persons, who had started in the USSR and yet agreed to go to postwar Poland, did not exceed 300, that is, one quarter of one percent; there were 46 in total who opted freely to go to the USSR. What they found was not the Poland they had left, but something very different.